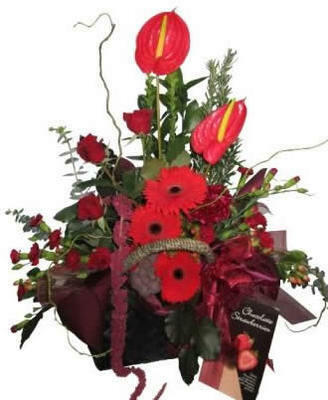 Gifts for Couples | Best Blooms Gift Delivery Auckland N.Z. Congratulations, Housewarming, Engagement, Anniversaries, or Wedding Celebrations. Some of the most joyful occasions in life are for a couple to share. Gifts and flowers that are perfect engagement presents, housewarming gifts, Wedding gifts, anniversary gifts or other special occasions when you need a present for a couple. For gift ideas for couples, the Snuggle Up gift basket is always popular, or a fruit basket, Flowers and chocolates or a big bright bouquet of flowers. Perfect for your parents or a gift for your best friends. Any couple will love these thoughtful gifts. We have a wide range of helium balloons so if you are wanting to send that perfect message we can add an engagement balloon, happy anniversary, welcome home, thank you and lots more balloons to choose from.